Dr. David Rodriguez-Quintana earned his medical degree and completed his orthopedic surgery residency at the University of Puerto Rico School of Medicine in San Juan. He completed his fellowship in hip and knee reconstructive surgery at Baylor College of Medicine in Houston. Board eligible in orthopedic surgery, Dr. Rodriguez-Quintana specializes in hip and knee reconstructive surgery. His clinical interests include primary and revision hip and knee arthroplasty as well as partial knee replacement. Dr. Rodriguez-Quintana’s practice is characterized by an empathic and individualized approach toward surgical patient care. He performs total hip replacements using both anterior and posterior approaches. His practice also encompasses the treatment of lower extremity fractures and developmental hip and knee conditions in patients of all ages. He is fluent in both of his native languages, Spanish and English. 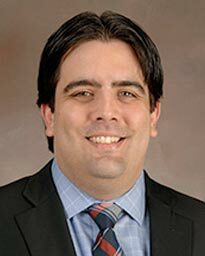 An assistant professor in the department of Orthopedic Surgery of McGovern Medical School at UTHealth in Houston, Dr. Rodriguez-Quintana has participated in medical book chapter evaluations and multiple clinical research projects. He is a member of Alpha Omega Alpha Honor Medical Society, the American Academy of Orthopedic Surgeons, and the American Academy of Hip and Knee Surgeons.